Today, Jagadguru Shreemad Vallabhacharya Mahaprabhu obtained Brahmasambandha Mantra from Bhagwan Shree Krishna. On obtaining this Diksha (Initiation) Mantra, apshri brought in order the system of initiation and the spiritual course for the disciples for Pushti Bhakti. Lord Shree krishna saw that the life of beings whom he had created for performing his pushti bhakti was wasted away. So he ordained Shreemad Vallabhacharya Mahaprabhu (Shree Krishnasya, Vadananavtaar of Lord Shree krishna) to manifest the sampraday i.e. sect of his pushti bhakti and to uplift Pushti beings who were down away in the flow of the time. The Path of devotion and resort of Shree Krishna which Shree Vallabhacharya proclaimed is known as Pushti Bhakti Sampraday - the devotional path of 'Pushti' i.e. Lord's grace. 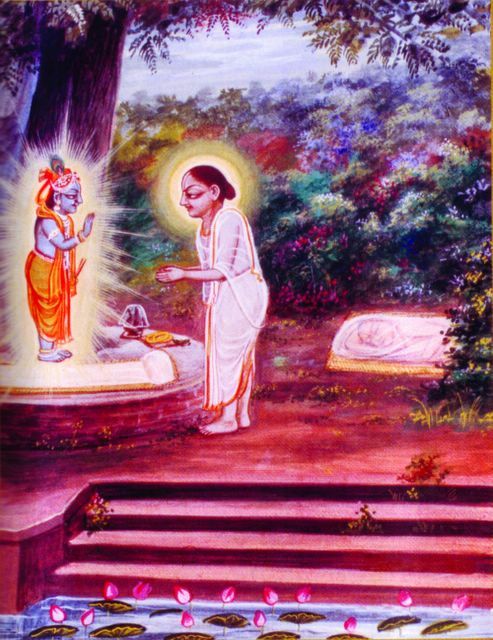 Shreemad Vallabhacharyaji, in one of apshri's granthas, named "Siddhant Rahasya", discloses this secret that how he got order to proclaim Pushti Sampraday by Shree Krishna. It was on this day in A.D.1492 at mid-night on the eleventh day of bright half of the month of Shravana that command of Lord came to him to give the initiation to people into the new way, Lord had revealed to him. During the course of his pilgrimage round india, he had come to realise something of the chaos that prevailed in the religious life of the country. Everywhere the people practised a type of religion, which had become altogether formal and lifeless. They followed more rituals and ceremonies which had lost their meaning and lost the sanctity with the consequence that there was no spiritual life amongst them worth the name. The situation is very well narrated by apshri in one of apshri's granthas i.e. 'Shree Krishnashraya'. Shree Vallabh felt this loss very much. What apshri saw in various places of pilgrimage he visited, had confirmed the above situation. Apshri came to realise that nothing less then a new revelation of Lord Shree Krishna could meet the situation. Seeing the plight of daivi jeevas in the bhutal and inability of daivi jeevas to reach to their primary goal to attain Lord Shree Krishna, Shree Vallabhcharya became worried. Since the primary goal of apshri's pragatya in butal was to guide Daivi Jeevas to attain their primary goal to attain Lord Shree krishna, apshri was worried about how will the daivi jeevas, who are filled with infinite doshas, can re-establish the relation with Lord Shree Krishna, who is completely void of doshas. This 'Viraha' of Vadanalavtar of Lord Shree Krishna i.e. Shree Vallabhacharyaji culminated in bhagwad pragatya in Shreemad Gokul near Govindghat. Lord Shree Krishna himself appreared before Shree Vallabhacharyaji in the swaroop of Shree Gokulchandramaji wearing White Paagh, Chandrika, Pichoda. Shreemad Vallabhacharyaji became so much excited and happy that apshri by having darshan of apshri entire shreeang, created a very famous ashtak in praise of Shree prabhu known as 'Madhurashtakam'. Shree Vallabh at that time, had a Pavitra made from cotton(Pavitra is a cotton mala made up of 360 cotton threads knotted together) already ready to offer to lord on dwadashi. But as Shree Prabhu appeared before apshri on Ekadashi, it was not proper to miss this opportunity and offer on dwadashi. Thus, Shree Vallabh immediately offered the Pavitra made from cotton and also offered the kesar mixed mishri to Lord. After that, Lord ordered apshri to re-establish the lost bhavna of 'Viraha' of daivi jeevas for him by initiating daivi jeevas with 84 lettered sanskrit mantra called as 'Brahmsambandha Mantra' and thus today is the prardhurbhavotsav of Pushti Sampraday. Pushtimarg is an eternal path of grace of Lord Shree krishna, which is eternal, but today Pushtimarg was also rendered as a Sampraday i.e. a sect by Lord himself and proclaimed by Shreemad Vallabhacharyaji. signifies one day's seva.So no matter if you are unable to do seva round the year. Experienced vaishnavas prepare pavitra at home. In A.D.1492 on the next day (i.e. Pavitra Baaras) Shree Damodardas Harsaniji adorned his Guru Shree Vallabhacharyaji with a pavitra. Thus its a tradition that today all vaishnavs adorn their Guru with a pavitra before taking prasad. Why 360 threads? : Poorna Purushottam Lord Shri Krishna is an ocean of 16 divine qualities. Apshris leelas span the 6 seasons. 16 * 6 = 96. If this is multiplied by 3, representing the three types of devotees, rajas, tamas and satvik, it reaches the sum of 288. Adding to that, the 12 months, one reaches 300. By adding the 60 minutes of an hour a total of 360 is obtained and therefore a 360 thread cotton pavitra is offered to Prabhu. etc have same shrungars and vastras. Thus, it is necessary to offer pavitra today. When to offer pavitra to Thakurji today: If 'Bhadra' is in morning, then Pavitra must be offered in evening during 'Utthapan'. If 'Bhadra' is in evening, then pavitra must be offered in morning during 'Shrungar' Darshan. 1. Firstly 'Adhivasan' of Pavitra and Rakhi is done together. 2. Venuji is offered and Darpan is shown. 3. (With Jhanj,Pakhavaj, Shankh, Jhaalar and Ghanta) After that, Shree Prabhu is offered first the 360 threaded Kesari Cotton Pavitra and then flower garland is offered. 4. After that Pavitra of 'Badla' (refer to above paragraph) is offered. 5. Mishri (Kesari) bhog is offered to Shree Prabhu. Pavitras are offered daily during this time to Shree Prabhu till Rakhi Utsav i.e. total five days. Today the pichvai and hindola are also adorned with Pavitras. Pavitra Arpan Vidhi tradition is very old. During Satyug, pavitra were made from various 'Gems'. In tretayuga, it was made from Gold. In Dwapar, it was made from Resham i.e. Silk. And in Kaliyug, it is made from cotton. Today, the 'Naubat Badhai' of Janmashtami Starts. For more details on types of badhai of janmashtami, refer this. The Utsav bhog of Pavitra comes during Gopivallabh bhog. The day of Pavitra Baras is like Guru Purnima for Shri Mahaprabhuji's Pushti Marg.